Hi again wonderful people of the forum. My good friend has received a invoice from a company called PPS for the sum of £60. They claim that the car was not parked in a bay at a tesco express car park at 5.32pm on a Sunday. The car actually wasn't parked in a bay, but it was parked in a position that did not block anyone. Anyway, is this another invoice from a private company? I am appealing as the keeper and ONLY Schedule 4 of the POFA (or evidence of who was driving) can cause a keeper appellant to be deemed to be the liable party. The PCN makes no attempt to pass liability to the keeper after 28 days. A vehicle can be driven by any person (with the consent of the owner) as long as the driver is insured. There is no dispute that the driver was entitled to drive the car and I can confirm that they were, but I am exercising my right not to name that person. As the keeper of the vehicle, it is my right to choose not to name the driver, yet still not be lawfully held liable if an operator is not using or complying with Schedule 4. Is that really the approved MSE template ? Private Parking Solutions (London) LTD appeal procedure is offered to drivers and Registered keepers the chance to appeal an issued Parking Charge Notice. IMPORTANT – Please read and ensure that you have included all the information below or your email cannot be registered and responded to. If you have not provided the above, please resend your email and include any missing information (if your PCN was sent by post, we will already have your name/address). Please do not email again (unless you are supplying further information/evidence) as this delays our response times. A response will be sent to you within 35 days from the date that the appeal was received. We will, however, endeavour to respond to your appeal within 14 days but this may not always be possible.  Please note that any correspondence and decisions from the Appeals Department will be in writing and may be emailed or posted using the contact details you have provided. If your PCN is paid then the case is considered to be closed and any correspondence received may remain unanswered. If you are not making an appeal, please contact the office on 01895 713136 for any other queries between Monday to Friday, 9 am to 6 pm. Let me inform you due to strict audits procedures we are unable to accept or deal with verbal appeals. only inputting the PCN number and nothing else. Errm say what? 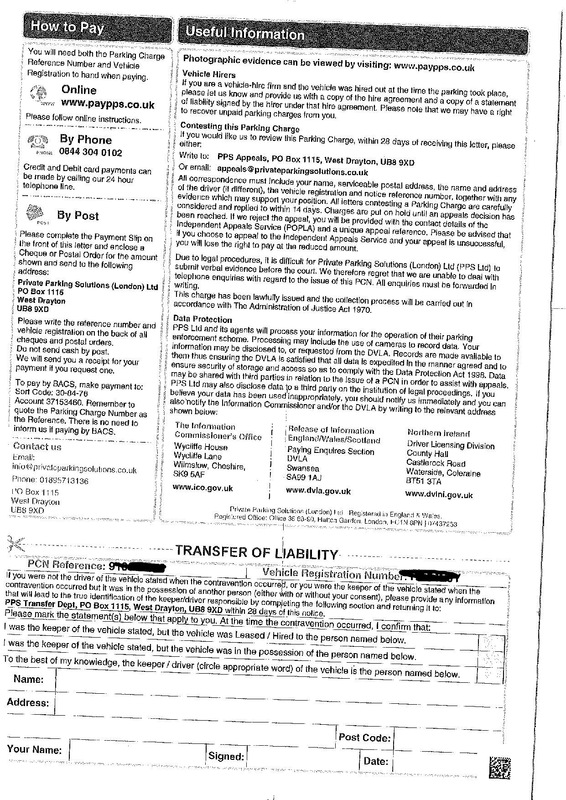 Tell us you did put in the keeper's name and address like it clearly tells you to do, under the template letter on MSE? We did not do that, but since they've already contacted DVLA and sent the letter to the registered keeper. Why would one need to input that again on the appeal? They already know it. So you didnt follow the dead simple instructions? Because without that detali, they dont have to consider this an appeal, becasue they have no indication it is from anyone in a position to appeal. The instrucitons are there for a reason. Clearly I can't. Neither can my friend. Which is the common sense I used when I advised my friend not to put his name and address. Perhaps you could check to see if the MSE information stated this or not? The MSE info tells you to jus tput your name and address in, in old, just below the appeal. Its difficult to miss, unless its skim read. 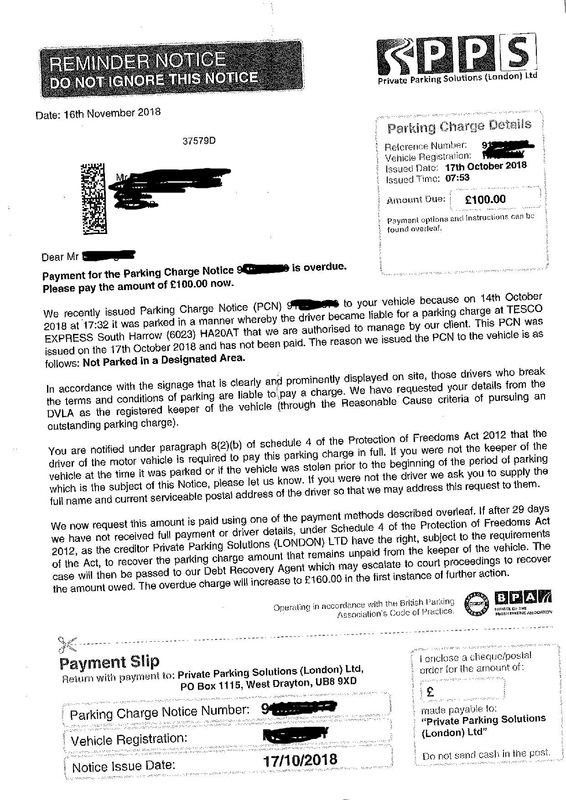 BPA Code of Practice explains that when a vehicle is parked in a private car park, the normal rule is that the DRIVER is responsible for paying the tariff fee (if any) for parking, for following the terms and conditions which apply, and for paying any parking charges. If you wish to give the details about the driver (name and current address for postal service) we will transfer the liability for the PCN, otherwise we will be able to pursue the registered keeper under Schedule 4 of the POFA act 2012. Please, find attached photographic evidence regarding PCN 910862XXX. Let me inform you due to strict audits procedures we are unable to accept or deal with appeals verbally. Remind them that they can only pursue the keeper if they have actually complied with the requirements of POFA. And ask for your POPLA code and remind them that the keeper's name and address is xxxxxxxxx (to avoid them using the excuse that they didn't know for sure, who the appellant was). I guess I will get my friend to knock up a quick reply with this information in. This parking company doesn't seem to be as easy as previous cases i've had to bypass. But he is willing to pursue this as far as possible, Purely on the basis that the car park used was such a wide open car park with lots of unmarked bays which could easily be classed as bays! Also the fact he uses this tesco almost daily. Do you think its possible to involve tesco on this? my friends wife works for them, and he also, when available, picks her up from the local stores. Surely tesco do not want to cause such problems for their customers and staff? I mean, if my friend did block anyone or parked in a poor location which could cause accidents or issues, I could fully understand the ticket. But if you street view this car park or check the pictures uploaded, you'll see its just bizarre why there aren't some extra bays marked here. And thats saying something for this country where almost every car park is usually crammed with spaces so much so that in some cases you can't even open your door to get in and out without tapping the vehicle next to you. Did you respond to them as per post #31? Yes, via email, no response to that. Email them again and remind them you have no POPLA code and will be complaining to the BPA about them. Do you know if tesco generally own the land/car park in their express stores? I am thinking to contact them to explain to them the situation. But not sure if they actually own the land or who to contact in tesco about it. They've now replied back within 30 minutes with a attached appeal rejection letter. They've also given a POPLA code. So now I take it this is the route we must take? POPLA appeal? What would be classed as suitable evidence or reason for appeal in this case? Car was not parked in marked bays. But it also wasn't blocking anything. Yes, but in parallel yo ucomplain to the landowner. Im guessing tesco don't own the land to tesco express stores? What would be the best method to find the land owner?